Maxine Z. Grosshans is a Research Librarian with a special interest in Foreign & International Law. She serves on a number of library committees that deal with the public services aspects of the Thurgood Marshall Law Library. She is also active in the Law Library Association of Maryland (LLAM). Ms. Grosshans received her B.A. from the University of Pittsburgh and her M.A. from the University of Chicago. She participated in the five-part Legal Research Institutes on Foreign & International Law sponsored by the American Association of Law Libraries. Maxine Grosshans provides research help, reference services and training on traditional and electronic resources in the Library. She has compiled numerous library guides for classes and workshops. In addition to presentations on various research topics to law classes, she regularly conducts library tours and training sessions for students taking courses in other schools and departments. 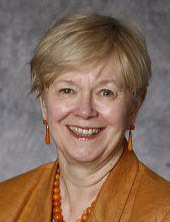 Maxine Grosshans serves as the library liaison to the Journal of Health Care Law & Policy, the Maryland Law Review and the International Moot Court Board. She also serves as Selector for Foreign & International Documents on the Notable Documents Panel of the American Library Association’s Government Documents Round Table.